Don't Get Caught With Fish Breath! 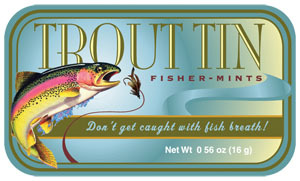 This "Trout Tin" of fisher mints is the perfect gift or stocking stuffer. Each .56 oz tin has a colorful rainbow trout taking a fly on the outside and tasty breath mints on the inside. At just $7.95 for THREE tins, you'll want to get some for yourself and some for friends!